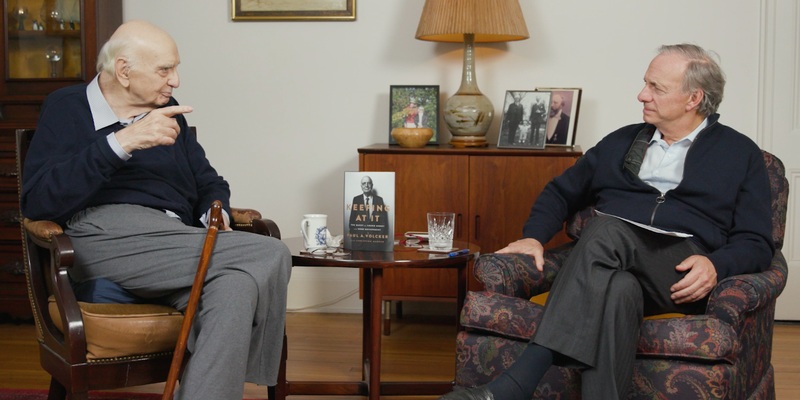 In an exclusive interview conducted by Bridgewater Associates and seen by Business Insider, Ray Dalio chatted with legendary economist and former Federal Reserve chair Paul Volcker. Volcker laid out three main principles that have shaped his worldview and helped him make world-altering decisions throughout his career. That’s how billionaire investor Ray Dalio describes his idol, Paul Volcker — the former Federal Reserve chair who’s commonly viewed as one of the most important and influential figures in US economic history. Dalio was particularly interested to hear about Volcker’s guiding principles — the ones that he’s used to make important decisions and assess the environment around him. After all, Dalio led the discussion by saying he views Volcker as the „most principled person“ he knows. The conversation came several months after the release of Volcker’s new book, „Keeping At It: The Quest for Sound Money and Good Government,“ which hit shelves on Oct. 30, 2018.